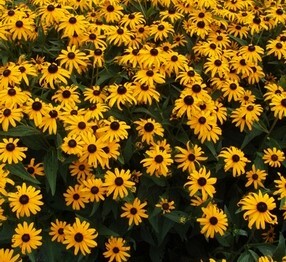 Black Eyed Susan is July Plant of the Month – Glacier View Landscape and Design, Inc.
Blackeyed Susan or Rudbeckia fulgida is a commonly used perennial orange coneflower. It likes full sun for best blooming, prefers dry organic soils, and will tolerate drought once established. It can wilt easily when first planted, so adequate moisture is required especially when planted in mid-summer. This is a great flower for a cut flower garden. It can get fairly large, 2-3’ across and high so it is best toward the back or center of a perennial garden. Good maintenance with deadheading of spent blooms will encourage blooming throughout the summer months. Goldsturm is a variety that is slightly more compact, but has nice 3” wide daisy like flower heads. Blackeyed Susan is native to parts of North America east of the Mississippi river, and is commonly seen along roadsides there. Further west in our Longmont Colorado Landscapes, Blackeyed Susan has been a staple of the perennial garden for decades. It was named the 1999 perennial plant of the year by the Perennial Plant Association. It was developed in Germany just before WWII but the war forced its release to be delayed. Its original stand was found in the Czech Republic in 1937. It was cultivated by Karl Foerster (of the Karl Foerster Feather Reed Grass fame). It mixes well with ornamental grasses and other native stands of perennials. Try some in your garden if you don’t have them already.